When starting a new company in a brand-new office space, you don’t always think about which commercial window tinting is the best for you and your employees, or whether it is even necessary. However, it is very important to invest in quality commercial window tinting – prolonged exposure to sunlight is harmful to the health of the skin, therefore, it is imperative to protect employees from the silent and insidious damage that ultra violet (UV) rays cause. The effects of UV rays are both immediate, like feeling drained and becoming dehydrated, as well as long term, like the development of wrinkles and sun-damaged skin which can predispose to skin cancer. That is why Solar Control® offers the best commercial window films – not only offering window tinting which benefits health, but also window films which offer increased privacy and security and specialized window tinting for decorative purposes. When it comes to commercial window tinting for office buildings or workplaces, the Solar Control® Commercial Window Films are the best on the market. This window film consists of a unique combination of multiple layers to produce a strengthened polyester film which is then applied to the windows. This technique has been shown to be the most effective in blocking the majority of the UV rays that would normally penetrate the window and cause destructive health effects. By blocking out the IR rays, which is what causes office rooms to heat up significantly, it also helps in temperature regulation by keeping the working space cool. The benefit of this is that there is a decreased need for the use of air-conditioning. There is also the added benefit of the reduction of light glare on computer screens, making the office working environment much more pleasurable. Occasionally, business owners require more durability and safety from their windows, especially if they are a store front or have a company display window. Solar Control® also offers a line of window films for commercial use that has increased durability and strength. Solar Control® Commercial Security Films are clear films that come in a variety of different thicknesses which are applied directly onto the window. These films perform the same UV filtering and temperature regulation as the previously mentioned commercial films, but have the added benefit of protection from natural disasters, burglars and gun fire (see the success stories here). This film has shatterproof properties and will not break apart regardless of the damage. These characteristics make for the best type of commercial window film for both health and security benefits. There are instances where windows inside buildings need to be tinted, for example, in hallways, conference rooms etc. for the purpose of privacy or special effects. Solar Control® Commercial Decorative/Specialty Films provides novelty films for specific purposes such as blackout film, or white opaque film. These films, like the standard films, provide the same amount of heat and solar protection. The first option, the white opaque film, provides a “shower-door” type of effect that allows light through, but no details can be made out. This is a popular decorative option to make the office aesthetically pleasing. The second option is the blackout film which blocks all level of visibility. This option is the best for clients seeking maximal privacy in the workplace while still looking professional and providing the benefits of having tinting windows. 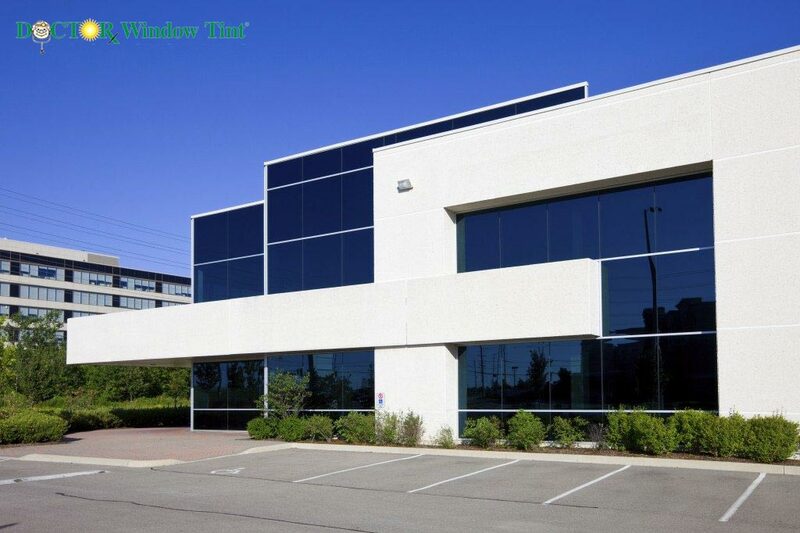 Commercial window tinting is something that is specific to every company’s different needs – contact your window tinting professionals at Dr Window Tint for any questions you have about tinting your businesses windows.